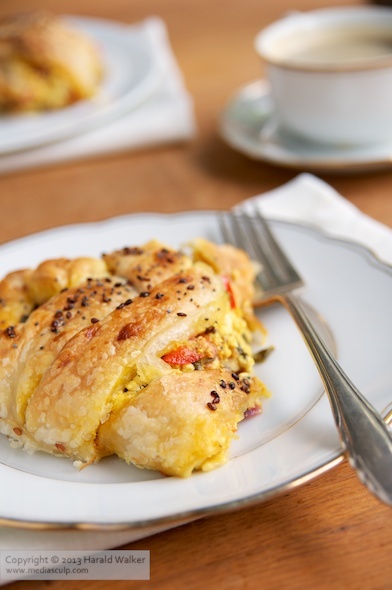 This is a delicious elegant breakfast or bunch recipe. It may seem complicated or a lot of ingredients, but once tried out, it’s not so hard to make. 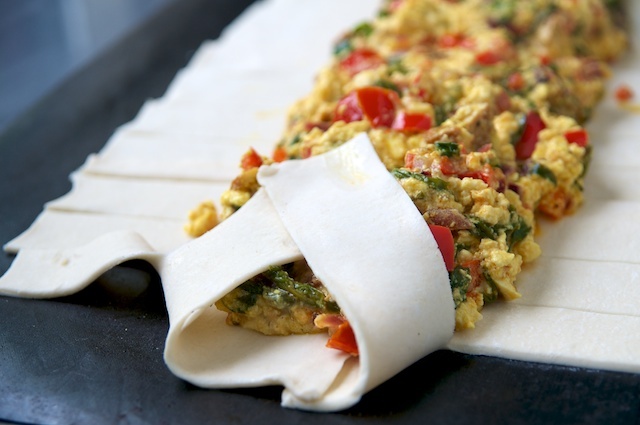 You could call it scrambled tofu en croute with vegetables. It tastes good hot or cold. Blend soy yogurt mustard, nutritional yeast, Tabasco and turmeric together and set aside. Prepare the onions, garlic, red pepper, spinach and tofu pieces. Saute the onion until it begins to soften and become glassy. Add the red pepper pieces and continue sauteing. Add the spicy tofu pieces. Add the spinach and cook until lightly wilted. 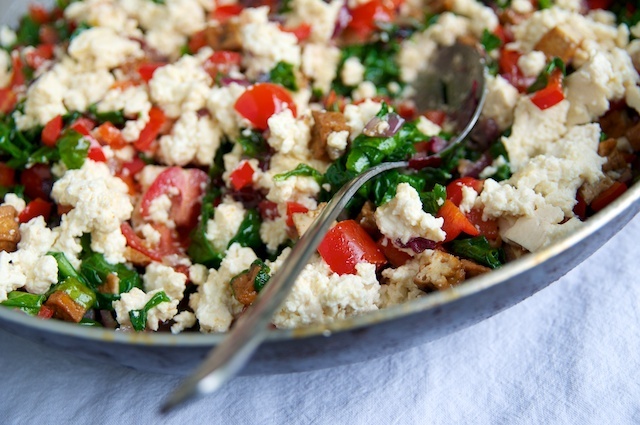 Add the cherry tomatoes and crumbled tofu. Add the soy yogurt mixture and cook until the mixture begins to become sold and the liquids are coked off. Preheat oven to 400 degrees. Line a baking sheet with a Silpat or parchment paper. Place the 6 sheets of thawed puff pastry next to each other in a row 3 by 2, slightly overlapping and using soy milk to connect the overlapping slices together. Spoon the tofu mixture down center of pastry, leaving a one inch margin on top and bottom and three inch borders on each side. 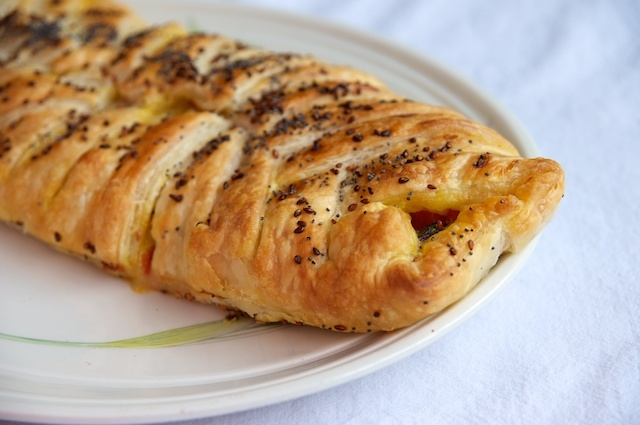 Cut pastry on side borders into one inch strips. Crisscross strips over top of filling, lightly brush each tip with soy milk to help stick the strips together. Brush top and sides of pastry with soy milk and top with seeds if desired. Bake for 30 minutes or until pastry is golden brown and puffed. Remove from oven and let cool a bit before slicing to serve. You can also make smaller versions by filling individual pastry sheets and therefor have individual parcels. Posted by Chris Walker on June 25, 2010 in Bell Pepper, Breakfast, Puff Pastry, Soy cheese, Soy milk, Spinach, Tofu, Tomato.